Heating water with your masonry heater is a great way to capture and utilize even more of the energy produced in these thermal mass wood burners. 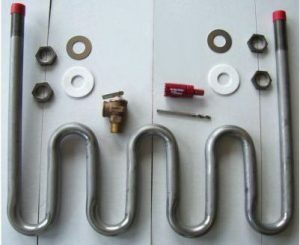 This is a time tested way to lower your electric and gas consumption and costs.We can size and install, one or more stainless steel, high-pressure heat exchange coils in your heater, which may feed either your domestic hot water tank or your in-floor radiant heating system. It is very important that you work with a qualified engineer and plumber to design and install your hot water system outside of the masonry heater. Pressure regulating valves are required and constant flow of the water during each burn is a must. The thermosyphon method or a temperature sensor driven pump must be utilized to ensure the water in the coil does not over heat.